If Livable Streets advocates were deciding the race to replace Eric Garcetti in CD 13, Mitch O’Farrell, a Garcetti deputy, would win in a land slide. While researching this story, I could not actually find anyone who regularly contributes to Streetsblog through donating, writing, or attending events, who is publicly supporting O’Farrell’s opponent, John Choi. Choi is a former employee of the Los Angeles County Federation of Labor and Mayor Villaraigosa. One of the main reasons given: O’Farrell is from the community. Choi “moved here last year”. Excluding those residents of Hollywood and some of the surrounding community who are still incensed by the Hollywood Specific Plan that encourages development and density, that is a huge plus for O’Farrell. Choi’s candidacy raises an interesting question, can any candidate really be a Livable Streets Candidate if they haven’t lived in the area they would represent for very long. Choi says all the right things, at the 10:12 mark of the the April 1 debate sponsored by Climate Resolve, he talks about implementing the Bike Plan for all commuters and his role pushing projects such as the Sunset Junction Triangle Park as a Public Works Commissioner. While O’Farell is hardly an outsider, some see his rise in city politics as proof that there is more than one type of insider. O’Farrell is a founding member of the Glassell Park Neighborhood Council, which was the third N.C. certified in January of 2002. O’Farrell, out for a walk with the the least enthusiastic group of volunteers I’ve ever seen. Bell’s quote is representative of many heard while researching this story and demonstrates the hill the well-funded Choi campaign has to climb. How do you convince people who don’t know you as well as they do your opponent that you can be trusted? 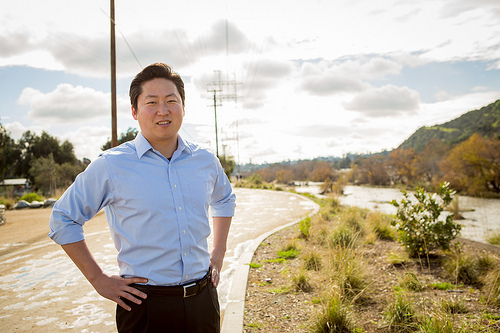 Even Choi’s record on local issues is called into question by community activists. Take Sunset Triangle. Choi boasts of his vote to create the park and argues it shows leadership and vision. And other argue that voting for a project as a commissioner is hardly the same as backing it. “He wasn’t even at the ground breaking,” one Silver Lake community advocate who asked for anonymity complained. Conversely, O’Farrell is very much a known commodity. Having worked in Garcetti’s office for a decade, he finds himself in a similar position as Mike Bonin did in the Westside race to replace Bill Rosendahl. How do you pay homage to a popular and successful boss while also selling yourself as something more than a third (or fourth) term for the man leaving office? One of the biggest advantages O’Farrell has is he’s been somewhat ubiquitous in the district for over a decade. I even met him in 2009 at a Critical Mass Die-In protesting police handling of a fatal crash on Glendale Boulevard. He was there to represent Garcetti to show support for increased traffic justice. Neither candidate’s Livable Streets vision is really breaking new ground. Choi’s proposals, as outlined on his website, are so generic they sound more like a statement from Move L.A. (another group he sits on the board of) for a regional clean transportation system than a specific plan for CD 13. O’Farrell offers more details than Choi in his campaign plan (click on the image at the bottom of this page) that includes a call for increasing DASH (LADOT local bus service) Lines and implementation of the bike plan. Of course, he does seem really excited about Sharrows, which were the city’s big bike improvement in 2010 but seem quaint compared to green buffered bike lanes or even separated facilities. Of course, neither of those candidates are going to be the next City Councilman for the district. Either Choi or O’Farrell will. It will be difficult to match Eric Garcetti’s Livable Streets record, no matter who wins. But for the advocates living in CD13, it’s hard to imagine a relative newcomer of even having a puncher’s chance. Actually, here’s an album Choi posted from a CicLAvia feeder ride: https://www.facebook.com/photo.php?fbid=450515608368531&set=a.450515568368535.1073741830.419850414768384&type=1&relevant_count=8. The LACBC had a meet and greet with the candidates last Saturday. I know they don’t endorse, but I was hoping they’d provide some feedback/information to the public about the event (I was there while Choi was and found him very conversant and apparently passionate about livable streets issues, but had to leave before O’Farrell arrived). This is a write up from Richard Risemberg who was at the LACBC meet and greet with both candidates this past weekend. Hah, Damien, I wish you had contacted me before writing this! I was at the LACBC meet and greet, and I think Rick did a good job describing the difference between the two candidates. Personally, I came away from the meet and greet a John Choi supporter. John hit the ball out of the park on question after question about biking, walking, and livable streets. He showed substantial transportation expertise (example: he talked about the need to eliminate cruising for parking in Hollywood). He wants to engage with larger policy questions at the level of the city, state, and beyond. He talked about wanting to get out in front on these issues and prove that new ideas can work. On specifics, he kept hitting the nail on the head, too. What do you think about Glendale Boulevard?” someone asked. He said that economic activity on that street was being killed by fast moving traffic and that the street needed some dramatic calming. When asked about the road diet on the full length of Hollywood Blvd. to implement bike lanes, he said that he’d sell the project as giving commuters another choice aside from being stuck in traffic. He wants to build cycle tracks on Sunset Blvd. to make that bike facility even better. Now all this is not to say that Mitch O’Farrell wouldn’t do a great job for livable streets. He clearly has proven experience. I am sure he would back good policies and projects as a council member. But when asked about his vision for transportation in the district, he was much less bold than John. And when asked about the specific projects above (Glendale, Hollywood, Sunset), he hedged on almost all of them. He’s a pragmatist who will wait to see what the community supports. And my impression is that many of Mitch’s supporters are neighborhood old-timers who don’t necessarily want to see these kinds of changes. In my neighborhood, that’s certainly the case. The same people (read: NIMBYs) who have Mitch O’Farrell yard signs also have three yard signs opposing every development in the neighborhood, too. I think both candidates will support a more bikable, walkable, and livable CD13. But John Choi is the one I want making the case for tough projects. He seems more willing to stick his neck out for change, and I think he’s got the political savvy to make that change happen. Loved the LACBC meet and greet with candidates this past Saturday – as a cd13 voter and over 10 year resident it was rad to ask questions on their transportation vision for our communities. As a community member that walks, bikes and uses transit was a great opp to make sure we’re interested in a even better CD13. funny, almost everybody came from LACBC organized meeting with them with support of Choi. I myself was kinda surprised by that and thought maybe I don’t really understand politics because I’m just a bicyclist..
but I think for us bicyclists it’s important to have fun open nice safe environments where we can walk, ride, meet people, etc.. basically Choi nailed it with answers.. even talking one-on-one about smth a little far from topic he understood very well and smiled when he understood the funny part of what I said.. Mitch on the other hand was too serious on things.. asking us how do we like sharrows.. didn’t really understand what I said to him.. and then said he wants to create more bumps on the roads..